View More In Renewable Energy - Page 2. The Sunforce 50012 1.8-Watt Solar Battery Maintainer is the perfect solution for charging the batteries of motorcycles, automobiles, snowmobiles, tractors and more. Made of durable ABS plastic and amorphous solar cells, this unit charges in all daylight conditions, even on cloudy days. Constructed with a built-in blocking diode to prevent reverse discharge, this solar panel is easy to install and completely maintenance-free. 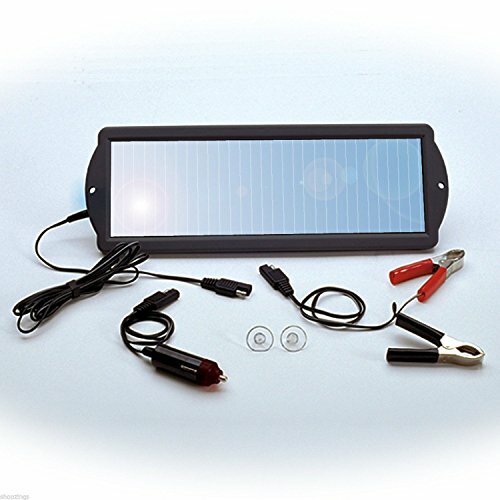 Just plug this solar charger into your vehicle's 12-volt lighter socket and position the panel to pick up the most daylight possible. Or, if you prefer, use the included alligator clips to connect it directly to the battery, so you can keep your lighter socket open for cell phone chargers or other accessories. Regardless of how you hook up the battery maintainer, you will always be able to start your vehicle. With a maximum temperature range of -40 to 176-degrees Fahrenheit, the solar panel provides 1.8 Watts or 125 mA of power to prevent the natural voltage drain of batteries over time. The complete kit includes a 1.8W solar battery maintainer, suction cups for easy mounting onto windshields, 7.5ft Wire, alligator battery clamps and a 12-volt DC Plug.